This year was stellar for the Riviera Nayarit, which had 15 hotels on this prestigious list: Dreams Villamagna Nuevo Vallarta | Four Seasons Resort Punta Mita | Grand Palladium Vallarta Resort & Spa | Grand Velas Riviera Nayarit | Hard Rock Hotel Vallarta | Imanta Resort; Marival Grand & Club Suites | Occidental Nuevo Vallarta | Riu Vallarta | Samba Vallarta | The St. Regis Punta Mita Resort | Villa Corona del Mar | Villa del Palmar Flamingos Beach Resort & Spa | Villa La Estancia Beach Resort & Spa | W Punta de Mita. The Readers’ Choice Awards are considered the most important of their kind in the travel industry and celebrate the best places on the planet: favorite cities, islands, hotels and resorts, airlines, and more. 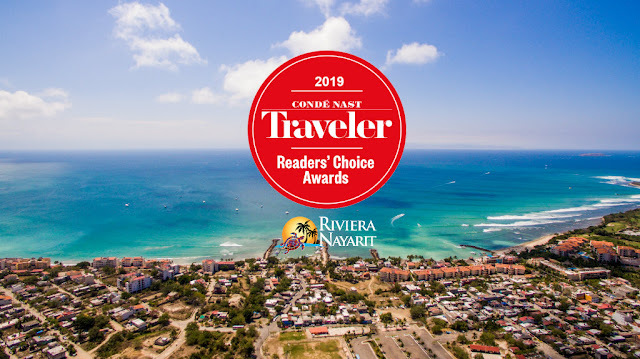 The inclusion of the Riviera Nayarit’s hotels is very important considering the list of nominees was compiled from the opinions of more than 429,000 Condé Nast readers worldwide who sent in thousands of comments, opinions, and reviews where they shared their most recent travel experiences. The Bahía de Banderas Hotel and Motel Association (AHMBB) and the Riviera Nayarit Convention and Visitors Bureau (CVB) congratulate their associates for this recognition that no doubt will contribute to the positioning of the destination as a premiere location of extraordinary luxury set in enviable natural surroundings. The inclusion of the Riviera Nayarit in the Condé Nast Traveler list of nominees is a direct result of the work done by the Marketing and Public Relations desk of the Riviera Nayarit Convention and Visitors Bureau (CVB), which promotes the entire destination’s tourist attractions in important international showcases with the support of the Government of the State of Nayarit via its Tourism Promotional Trust (Fiprotur).